Dolorosa Waldron was a 17-year-old clerk in the GPO when, on Easter Monday 1916 she was confronted by Padraig Pearse and the rebels of the Rising. Determined to start a revolution, the rebels told her to run home to her mother. Later, Dolorosa entered the Sisters of Mercy and was assigned to their mission in Nairobi where she founded the Matter Hospital, the first Catholic inter-racial hospital in Kenya and now one of Kenya’s most respected hospitals. Perhaps, if the 1916 Rising hadn’t happened, Dolorosa’s destiny might have been different. God only knows. But this is just one story of a fascinating collection the Irish community in Kenya have unearthed to commemorate the centenary of the 1916 Rising. 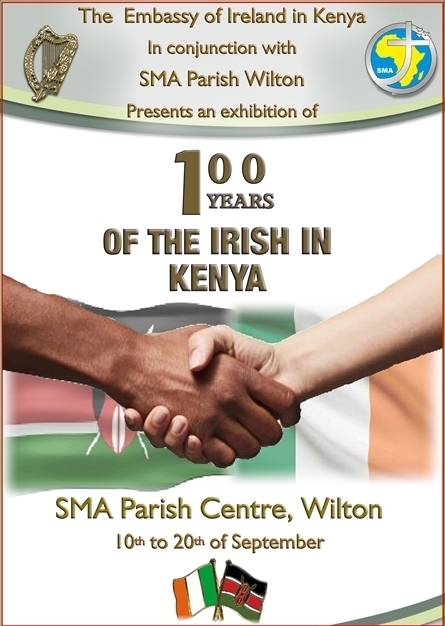 The Exhibition, 100 years of the Irish in Kenya, is an initiative to commemorate, in a positive manner, the Rising. On December 16, 2016, the Irish Times published an article by Brona Ní Mhuirí detailing the origins of the project. You can read the article by clicking here. 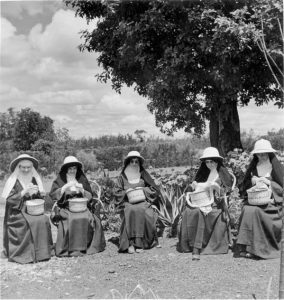 Through interviews, family documents and religious archives the exhibition captures the stories of the Irish in Kenya over the 100 years since 1916. The exhibition is arranged thematically, in health, education, agriculture and sport. It highlights the contributions of Irish individuals, NGOs and businesses to the development of Kenyan society. It outlines the important role played by the Kenya Irish Society in support of Irish citizens over this period. It outlines the changing Irish official presence in Kenya since Independence and the growing influence of the many Kenyans living in Ireland. It is not an exhaustive account but helps to shed light on the vitality and energy of the Irish in Kenya. 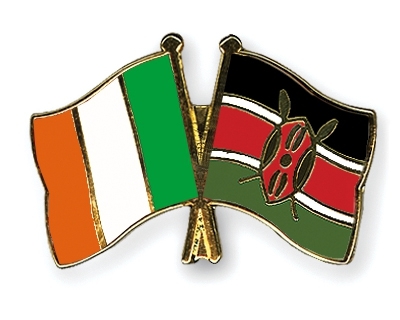 There are approximately 1,500 Irish people living in Kenya today. The younger Irish work for the UN, NGOs, in business and trade. The older Irish, many of whom are in their 70s, 80s, and 90s, are missionaries who went to Kenya in the late 1940s. Others are Irish who served in the British Armed Forces and who settled into civilian life after WWII. Yet others are 2nd generation Irish whose parents went to Kenya in the early 20th century either to work directly for the Colonial Office (Ireland still being under British rule) or to avail of the opportunities that a fast-developing East Africa provided for the young, the adventurous and for Irish professional and business people whose scope was limited by a small island community. These Irish represent all traditions of the island of Ireland. They were entrepreneurs, teachers, doctors, aviators, farming and motoring pioneers, development workers and, most especially, missionaries, both religious and lay. The Kenya they encountered in many ways mirrored their own experience of home – agricultural, traditional, poor in material wealth but with a rich culture. These Irish stayed to become an integral part of the development of a newly emerging African country. So, from agriculturalists to aviators, medics to missionaries – this Exhibition tells some of their stories. The Irish went to Kenya and fell in love with a country and people that in many ways mirrored their own experience of home. Many went as missionaries and stayed to help provide healthcare and education. Others went to rapidly developing East Africa to become involved in setting up medical practices, motoring businesses, training schools and agricultural colleges. The Holy Ghost Fathers, among them Irishman, Fr. Tom Burke, grew the first commercially viable coffee plant in Kenya. The Motel T Ford was first imported by Irishman, JJ Hughes, who went on to own the largest mother company in Kenya. Paddy Deacon (Member of the Order of the Burning Spear) was a founder member of the Federation of Kenya Employers and gave management training courses to the Kenyan Federation of Labour. Irishman, Fred Dalton, was the first managing director of East Africa Railways and Harbours. St. Mary’s School, Nairobi; St. Patrick’s High School, Iten; Strathmore College (now Strathmore University) were all founded by Irish people. Dr. Denis Burkitt, from Fermanagh, was the first to describe and discover a cure for a childhood cancer in Africa – today known as Burkitt’s lymphoma. The impact and influence of Irish missionaries, from the flying nuns of Turkana to the slums of present day Nairobi, has been a continuous Irish thread for over a hundred years. The internationally acclaimed Shalom Centre for Conflict Resolution and Reconciliation, Nairobi, established by SMA missionaries. Kenya’s double 800m Olympic Champion, David Rudsha, has as his coach Irish Patrician Brother from Cork, Br Colm O’Connell. Br O’Connell has coached more than 30 Olympic and World Champion athletes. This is just a flavour of some of the stories of the Irish in Kenya over the last one hundred years – there are many more untold.